One of the sought-after properties in Pattaya, Flipper House Hotel is located within 10 minutes drive from Pattaya Beach and about 15 minutes drive from The Sanctuary of Truth. The hotel features two outdoor pools with jacuzzi, and Wi-Fi access, so that guests can enjoy their time while they are indoors. Moreover, guests can remain well-groomed during their holidays with the assistance of hairdressers and dressmakers. The hotel also houses impressive banquet halls and meeting rooms, suited for organising different events. The hotel has a restaurant that serves flavourful Thai, Asian and European delicacies. It also has a poolside bar, where guests can enjoy some light moments with friends. The property has 192 rooms that are available in five categories, namely Standard Room Wing A/B, Superior Room Wing B/C, Deluxe Room Wing A/C, Mini Suite Wing B and Suite Wing C. All rooms feature modern amenities, including cable TV, direct dial phone and mini bar. Guests can go for an evening stroll at Pattaya Beach and enjoy stunning views of the sunset. Deal Applied: MMTOFFM9A. You Get Flat INR 679.0 OFF! Deal Applied: MMTOFFM9A. You Get Flat INR 753.0 OFF! Deal Applied: MMTOFFM9A. You Get Flat INR 865.0 OFF! Good location, normal Hotel, but staff behavior is not good, very demanding for money and not been accommodative. Understanding is a big issue with them. Nice Hotel, good location, breakfast till 12. The best Hotel in Pattaya, good location, walking Indian restaurants. Perfect hotel with perfect rooms, loved it. The rooms of the Hotel are very congested, no coffee maker, old tv and also the staffs are not friendly. Good looking, good location, good services. Please provide tea maker. Water on demand. No room service. Nice spacious room. Next to pa tong Beach. Well organised pool and overall beautiful experience. Lovely stay and Worth staying. Excellent. Wish you to continue your best. Plug point location not convinced, one day only heavy noise in the room, like drilling work. Other wise good, very good accommodation and good response from the reception. House keeping team doing good with smiling face. I never forgot the those days in your location. Thanks to Flipper House team. Pathetic stay. Was put up at their penthouse but there is no lift in the property. No bell boys so had to personally carry my baggage 3 floors up. Had breakfast in my package but they couldn't provide it even at 8:30 AM stating their cook is still asleep. Room space, break fast and Hotel location good other everything is worst. Not value for money. Towels are bad smell and very old, bed sheets are not quality, some reception stops are not good, worst security system. Food is OK. Room space is OK. The Flipper House Hotel Pattaya is located very close to the Beach (3 min walk) and has a decent pool and an awesome breakfast. There is no free-wifi. They charge 150 THB per day for that. The rooms are neat and clean. They do housekeeping every day. There is an refundable deposit of 500 THB per room. The place is close to the Massage Parlours. You can reach Walking Street by the 10THB tuk service or a 15 min walk along the beach. Overall a value for money Flipper House Hotel Pattaya with good staff and all required amenities. No charges for guests. Family Mart bang opposite to the Flipper House Hotel Pattaya! The location was just a 5 min walk to the beach. It is right in the center of all the location at Soi 7. Walk Street is about a 30 minute walk or you can take a bhat bus. The only issue I had was with the Wi-Fi. For some reason there was no Wi-Fi connectivity in my room. I kept disconnecting. The extended breakfast until 1 PM is the best thing about the Flipper House Hotel Pattaya. If you wake up late after a long night you can still go eat breakfast until 1 PM. The room service was great and the food was delicious. Very nice & clean Flipper House Hotel Pattaya and in a middle of a lively location. Good Breakfast but lack of Indian foods we so much missed Indian spices flavor, I request to Flipper House Hotel Pattaya administration please add some Indian food in your menu at least you can add plain curd and Paratha. Very beautiful rooftop pools. No issue with Wifi. Very cooperative staff. Like to visit again surely. Highly recommended If they add plain curd and paratha in their menu. I along with my wife stayed at Flipper house Flipper House Hotel Pattaya in October 2018. The Flipper House Hotel Pattaya is a new construction with very clean rooms, good Breakfast buffet with plenty variety for all. It is in soi 7 so around 1 km from walking street. Only problem is Flipper House Hotel Pattaya doesn't provide any coffee maker in room which is a drawback because I am a coffee person. between roof top pool is super nice. The location of Flipper House Hotel Pattaya was excellent and the best part is this is a guest friendly Flipper House Hotel Pattaya means you don't have to pay extra charge if you bring a friend or someone. Very near to clubs, bars and Beach. And the buffet breakfast was excellent but I would suggest to add some Indian dishes in buffet as well. I liked everything. Location was excellent. I would like to say thanks to Flipper House Hotel Pattaya management, the staff are very helpful and cooperative, great location, the Flipper House Hotel Pattaya is very near to all the attractions like beach, night bazaar, walking street etc, the rooms in the Flipper House Hotel Pattaya is very clean. Whenever I go to Pattaya then I will stay in this Flipper House Hotel Pattaya. Comfortable stay except for the room size which was smaller than expected. The lighting in the room was also very less. Except that everything was good and up-to the mark. Room size was very small as was not expected. The room looked little bit spacious than what it was. Location was great as it was close to all the markets and the beach. Restaurant breakfast was good too. Breakfast had tons of varieties of food and beverages, staff was very friendly and helpful. Overall our stay was excellent. Staff’s behavior was very good. They were very cooperative in every need of ours. Overall Stay was excellent as Flipper House Hotel Pattaya is situated at very convenient location from every famous places you want to visit in pattaya. This is probably one of the best Flipper House Hotel Pattaya near to beach and other things. 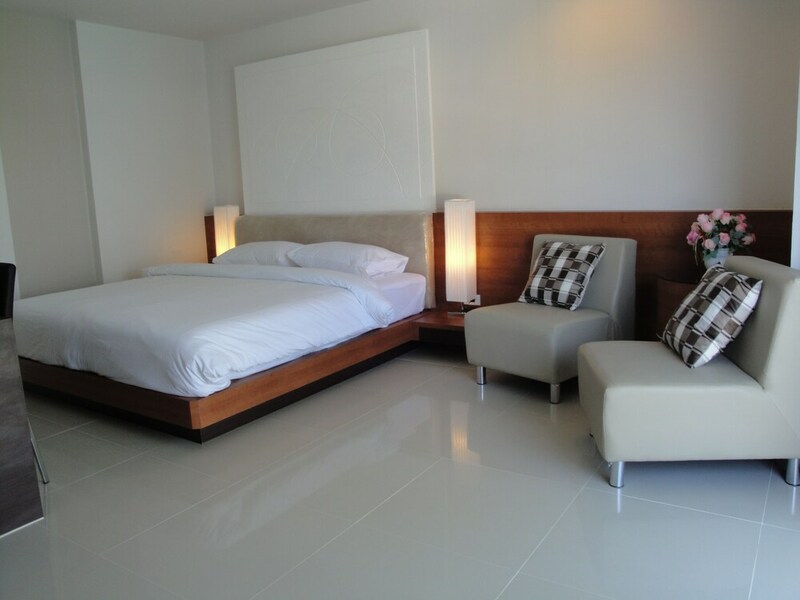 Rooms and Flipper House Hotel Pattaya is very clean and well maintained. Staff behaviour is really nice and they are always ready to help you with smile. Morning breakfast is awesome with many varieties. It's a must recommended Flipper House Hotel Pattaya. Awesome value for money and great location for single travellers... It's located on Soi 7 which is nearby to Central mall Pattaya and nearby. There are plenty of options to eat and also bars for outing purposes... The Flipper House Hotel Pattaya has breakfast till 1 pm in the afternoon which is great for late sleepers. Well go the same place. Nice breakfast till 12 noon and good swimming pool with poolside bar, can view beach in the swimming pool. Location is also good only 200 meters to beach. Awesome value for money and great location. The Flipper House Hotel Pattaya is providing good service, facilities decent ambience. It was a really nice stay. The staff was very helpful. The room was very clean with all the amenities. The location was great. All the tourist place was near like beach road, shopping, walking street. If I visit again, I would love stay in Flipper House again. It was an wonderful experience and stay. As you get out there are lot of bars. Recommend for solo travellers. I have been staying in this place for more than 6 times in last 3 years very near to the beach. Hotel is clean and the breakfast is just right. Decent stay for a good price. We sent a group of friends to this place and they were fine with the property at all levels. Very nice and friendly staff with a advantage of good location as well. Food is issue for Indians otherwise it a worth to stay here. Awesome stay and nice food, overall just awesome Flipper House Hotel Pattaya with cheap price. Nice Flipper House Hotel Pattaya at a great location nearby to beach, though rooms are pretty small but are value for money. Great options for breakfast and also is available till 1 PM which is the best thing. With the price like this its totally value for money. Good location, nice comfy rooms, friendly staff and close to all major attractions. I loved my stay there with friends. Excellent service, well behaved staff, cooperative, humble and friendly. Good location. Food Flipper House Hotel Pattaya and helpful staff nice place prompt service provided by Flipper House Hotel Pattaya staff. Well cleanliness, rooms are too good and well-maintained. Breakfast good nice experience of swimming pool surrounding, locations are too good. Room little bit short. Otherwise nice place to stay. Walking distance to Beach Road and walking street. Enjoyed delicious breakfast with varieties of menus and Flipper House Hotel Pattaya employees are so humble, cooperative and caring thanks to them. Hotel location is very near to the sea. Everything good in the room and Flipper House Hotel Pattaya. Stay was awesome. I love the location because its in Center. Near to most of the places, You can enjoy a lot all the day. Room was good and near to all main places. Value for money. Located in the center of the location near beach road and Maner pubs around. They need improve the toilet fittings. Flush not working properly. Excellent Flipper House Hotel Pattaya, near to everything. Very well located, very close to night life, beech is also at walking distance, pool is OK, morning breakfast is good and reception staff is very helpful and good. Overall a very good budget Flipper House Hotel Pattaya. Value for money. It's a worth to stay here. Very friendly staff and nice location. Food is issue for Indians otherwise good to stay here.